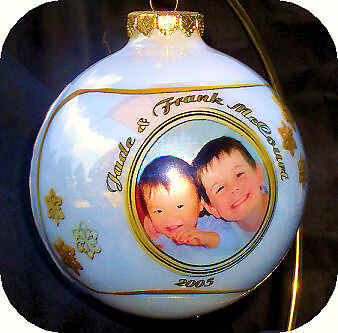 The Christmas ornament may be personalized with any photo, in color or in black and white; and custom printed with any personalized text. Once you add your own photo and text, you have your own unique Christmas bulb. We customize a large 3-1/4 inch white pearl glass Christmas ornament by printing your image and text into one of our pre-designed borders onto a clear band and then affix the banded image permanently to the ornament. Each ornament is individually packaged in a protective, clear display box. Some of our customers make a true FAMILY TREE for Christmas, by purchasing ornaments with pictures of each family member, including grandparents, parents, children, aunts, uncles, cousins, pets, ... Hang these ornaments on a mini-Christmas tree to make a family table decoration. Let your family and guests savor the memories and admire their NEW FAMILY CHRISTMAS TREE. Our server will email you confirmation of your order with the Order Number in the subject line. Reply to the order confirmation by attaching your picture. Please note if you wanted a proof of the ornament, we can offer this upgrade at a $10.00 surcharge. We are excited about bringing you this new option for our glass photo ornaments. We've just received our first container of special glass bulbs from Bohemia. Our standard bulbs are the highest quality American made glass ornaments that we could find but they are typical Christmas glass balls which are fragile. These new Bohemian glass bulbs are break resistant! They are about five times the thickness of our American made bulbs. You can drop this glass ornament and it will not break, unless dropped on a ceramic tile or concrete/stone floor. These Bohemian Glass Ornaments are blown by Bohemian Craftsman from a special SIMAX Glass - thicker and more durable than our standard bulbs and have a deeper and richer hue, making your images even richer looking on the bulbs. They are available at $10.00 upcharge. Look for this option on a drop down menu on the bottom of this page. No matter which option you choose : the economy Acrylic, the classic Glass, or the Break Resistant high class Bohemian Glass, we are sure you will LOVE your ornament or your money back! Good : acrylic ball ornaments (new economy option)! Acrylic balls have a visible seam on the side but if you are looking for unbreakable economy option to glass ball, this is your best choice!